Today's NOTD is Tomorrow Never Dies from the new 2012 Holiday Skyfall Collection! This is just one of 12 nail polishes that OPI created with Sony to celebrate 50 years of James Bond 007 movies. 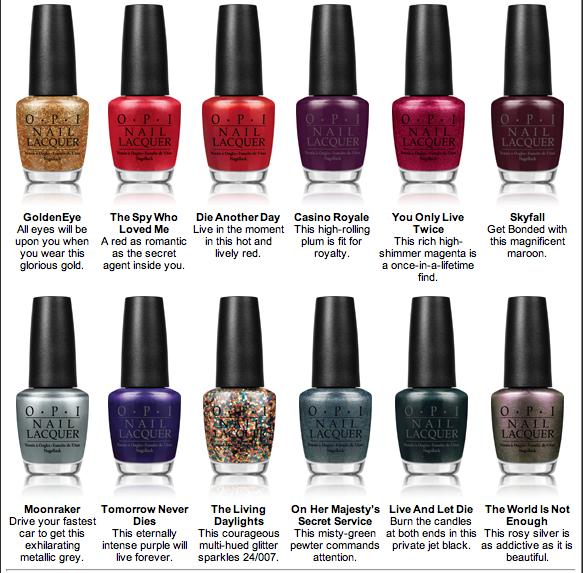 I absolutely love the names of the nail polishes because they are all titled after the movies. I thought it was so creative that even the colors of the nail polishes reflect the mood of each movie. For example, Moonraker is a beautiful silver/grey color whereas Die Another Day is a bright red with orange undertones. Die Another Day is a deep, true royal purple color that dries to a satin finish. If you look very close, it has the slightest pink shimmer in it that catches so beautifully in the light. 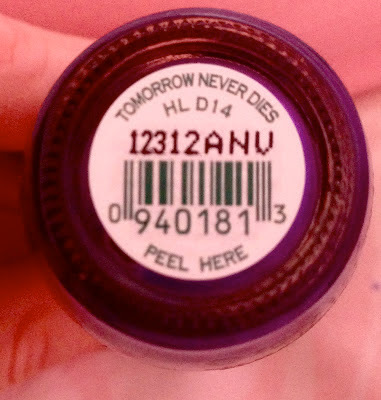 I am really impressed with the formulation of this nail-polish. It dries quickly and is really easy to apply (even on my short nails). With two coats, it is wonderfully opaque and rich. Even though it seems to be a pretty standard color, it definitely looks classy and unique once applied. I have actually received a lot of compliments wearing this! Also, it's a great color for this winter since jewel-toned nail polishes have been so popular recently. Die Another Day and the other 11 polishes in this collection are limited edition colors that will only be available this winter. I have had my eye on Casino Royale and GoldenEye so I might just be returning to Ulta to buy some more before they sell out! What would you buy from this collection?